Knowing the kinds of people who live in our community and the problems they face can be an incredible benefit when it comes to programming for ministry and outreach. In a church plant where I’m involved, we ran a demographic program search for a three mile geographic radius surrounding our meeting location. We were provided more than 25 pages of data on this area to help us understand our community. We were able to review more than 100 different categories to help us better understand our neighborhood. We even received maps that identified where various parts of the population resided. 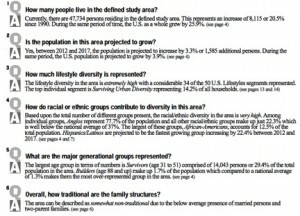 I especially liked the first few pages of the report that summarized the data in an easy to understand Q and A format. The image at right is what it looked like. There was a lot more information than this, but notice just a couple of realities from this snapshot. Q and A 4 revealed that our area is high in racial diversity. This could present a problem for our church in reaching our immediate geography since we do not have as much racial diversity in our core group. We began to think about what kind of ways we as a core team could become more diverse, and if that were not possible, perhaps we could focus on a specific group that our outreach teams could target for mission? Notice that Q & A 5 gave us insight into the various age groups of our community. Had we thought about programs or events that might connect with each segment? Even Q & A 1 was surprising to us since we never would have guessed that so many people lived in such a small geographic area. The harvest field was dense, but did we understand that reaching even one percent of the population would mean a church attendance of 480? Sometimes data like this can really open our eyes to what is around us and the opportunity God has granted us to make a difference in people’s lives. It can help us to see things differently, or perhaps see for the very first time the harvest filed around us! In the information age, there is available to us a volume of data that can help us think more strategically about our outreach and church programming. 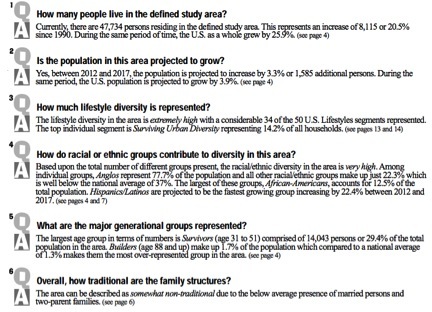 As I mentioned, the demographic program we used can provide more than 100 different kinds of data and can provide geographic areas of study from as small as a city block to as large as a state county. The best part is that the information is free to any Grace Brethren church that wants to use it!